Love Talk Starters is the perfect tool for better understanding each other. Each page offers creative, surprising, fun, and deep questions designed to engage couples in the romance-building conversations every thriving marriage needs. Every couple wants to connect through meaningful conversations, yet when you finally find time to talk, it's often hard to know where to start. In this helpful little book, bestselling authors and respected marriage coaches Drs. 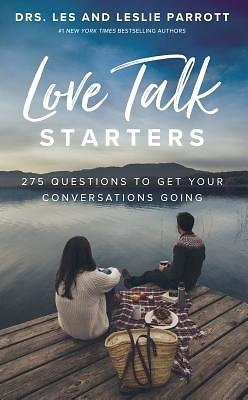 Les and Leslie Parrott present 275 intriguing questions to kickstart meaningful conversations that will inspire strong and intimate connection in your relationship. Whether engaged, newlywed, or long-committed couples the closeness husbands and wives seek starts with inspiring dialogue - for date nights, special occasions, or any time you need to find your way back to each other. Designed to sharpen your love talk as a couple, and help you discover more about yourself, your partner, and your relationship, these Starters are just that - the start to the more fulfilling, joyful connection you want.